Investing in a woodlot is a big step for most people. The purchase of woodlots require a lot of money. You need to find the right woodlot to match your objectives and/or investment needs. Questions such as "What type of woodlot do I want? Where do I get the money to purchase it? Where do I find a woodlot to purchase? Will I pay too much for it? Will I get good title?" should be asked when deciding to purchase a woodlot. Before investing in a woodlot there are many things to consider. This lesson will help you to answer these questions. You will learn how to match your objectives with woodlot characteristics in choosing a type of woodlot to best meet your goals. You will also learn to identify a potential woodlot, to value a woodlot, and will be exposed to instruments used to transfer titles. WHY INVEST IN A WOODLOT? People invest in woodland for recreation, for financial returns, or simply because they want to own a piece of the land. Other reasons may include keeping the woodland in the family or because the woodlot is part of the purchase of another asset such as a farm or cottage. Whatever the reason, purchasing a woodlot is exciting. It should also be a time of careful consideration, since each woodlot is different and has unique characteristics that should be considered in finding the ideal lot for you. Each lot has its own challenges and potential, and not all woodlots will meet your investment objectives and individual needs. When preparing to purchase a woodlot, it is helpful to ask yourself, "Is this a short term or long term investment?" and "Do I have the financial resources to successfully complete the purchase?" A woodlot is sometimes purchased for speculation purposes. The objective in this case is to invest in the property in the hope that there will be great demand for the land and resources in the near future. This situation would allow you to sell it and realize a significant financial gain. An example of this would be a woodlot purchased for $10,000 that is sold two years later to a buyer for $20,000, generating a capital gain of $10,000. Because of the long term mature of woodlot management a woodlot usually does not make a good speculative investment. 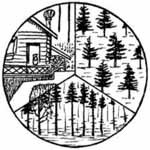 Cabin rental, Christmas trees, and forest product sales can generate income. A medium term investment is to purchase the woodlot for income generating potential. The income can be used to regain some of the capital used in purchasing the lot or to make improvements to generate more future income. For example, one could purchase a woodlot that includes Christmas trees, some mature fibre that could be sold for stumpage (a royalty paid to the woodlot owner for the right to harvest the fibre), and a hunting lease from a local outfitter. The income earned from these ventures could be used to recover some of the capital used to purchase the property, improve the Christmas tree lot, reforest the harvested areas if required, or improve conditions for hunting to generate more income. Young woodlot - a long term investment. Long term investment in woodland generally refers to the purchase of a woodlot with young trees, where by most of the mature trees have been removed by fire, insects, or man. The trees will grow, increasing the woodlot's value over time. This type of investment is popular way to generate retirement income or build a nest egg. Although trees in the Maritimes do not grow as fast as they do in more southern climates, they do grow fast enough to make purchasing a woodlot a reasonable investment. In simple terms, the quality of the investment depends on the amount of wood present now and the growth rate. Common Maritime growth rates are listed in Table 1. Table 1. Potential Growth rates of Nova Scotia forests. Management can also increase quality which will also increase value. Planning the purchase of a woodlot allows you to combine short and long term objectives with your personal goals. Managed properly, you can own a property that will generate income as well as maintain a reasonable rate of growth on your investment, so that there will be a nest egg for your retirement. Matching woodlot investment objectives with available woodlot. Based on the woodlot description, which woodlot would best meet the needs of the buyer whose objectives are stated. Please indicate which woodlot lettered A through E best match buyers numbered 1 through 5. You may record your choices below. 1. I have some extra cash and am looking for a place to make a fast dollar. A. Woodlot located close to home, approximately 10 acres of Christmas trees along a road right-of-way. The rest is forested with many age classes. 2. I am looking for a second income and would like to work outside. B. Woodlot is one km from a road; a fire went through 25 years ago, and the forest has rejuvenated back in dense hardwood and softwood. 3. I have exhausted my contributions to an RRSP plan and would like to invest in something that will be there for my retirement. C. Woodlot located by Trans-Canada Highway. It is forested, but supposedly sitting on a huge reserve of building material. Word on the street is that a huge highway project is upcoming in the area. 4. I always wanted to own some land and not be concerned if I make money or not. D. The resources of the woodlot have been depleted. The forest is staring to rejuvenate, and with some work, such a thinning and planting, would become very productive. It may be available at a good price because the resources have been depleted. 5. I want to invest on a piece of land to go and enjoy my days off. If I can make some money that would be great! E. Woodlot is located at the base of a mountain. It is a diverse property with forest openings, a small lake, and some trails cut across the front section. There are some high value wood products on the side hill, and if harvested properly could generate some income. 1. (example) Retirement nest egg without a huge capital investment. Young woodlot, close to home, so I can watch it grow over time. Before looking for a woodlot you should assess your financial resources to make sure you can secure the required dollars. It can be frustrating to locate a woodlot you would like to buy then find out you are unable to complete the transaction because of lack of money. Financial Institutions - generally require a mortgage to secure the loan. Family and friends - not for everyone. When calculating the amount on money required to purchase a woodlot, remember you will need more than just the purchase price. You will need to hire a lawyer to search the old deed and prepare the new one, and you may also need the lawyer to prepare a mortgage. There might be an obligation to pay property and sales tax. Once you have decided on the type of woodlot to purchase and have determined your financial resources, you are ready to begin your search. Occasionally woodlot owners will list their property with a real estate agency. Generally the agency will have information on the property which has been supplied by the owner. This information may include a woodlot map, aerial photographs, and a survey plan. As well, the agent may be willing to take you to the lot to show you some of the woodlot features, such as roads, boundary lines, and ponds. Newspapers, particularly local ones, are a possible lead for properties for sale. Owners will often advertise property for private sale. An estate settlement or a foreclosure on a piece of land can lead to a sale of land at an auction. It is recommended that a person wishing to purchase land through an auction conduct all their research on the property prior to the sale. With your research complete, establish a maximum price that you are willing to pay and stick to it during the bidding. Municipalities occasionally conduct property sales to recover delinquent taxes. The dates and locations of these sales are advertised in the local paper. One note of caution: depending on the circumstances surrounding the property, you may not get clear title from the municipality until one year after the sale. It is advised that you ask representatives of the Municipality what type of title you will be purchasing. This is done so that delinquent landowners have a grace period after the sale to pay their taxes. As with an auction, research the property prior to the sale. Many sales require you to have 10 percent of the purchase price in cash or certified cheque and the successful purchaser will have 10 to 30 days to pay the remaining balance. Many woodlot owner associations publish newsletters which occasionally advertise woodlots for sale. You may find out more about these newsletters by contacting a woodlot owner group such as the Nova Scotia Group Venture Association or Nova Scotia Landowners and Forest Fibre Producers Association. One of the best ways to obtain leads on possible land to purchase is by word-of-mouth. For example, you may be talking to an individual who may refer you to a friend that has been thinking of selling his or her lot. A phone call to find out more may reveal a woodlot that meets your needs. If you see a woodlot that interests you, you may wish to contact the owner directly to see if he or she would be interested in selling it. Once a potential property has been identified, collect as much information about it as possible to ensure that you are fully informed before making your investment. Several resources are available to assist you. Approximately 8000 private woodlots in Nova Scotia have had forest management plans prepared for them. Ask the owner if he or she has a management plan and if you could review it. These plans are an excellent source of information about boundary lines, types of forest cover, and infrastructures, such as roads and bridges that are on the property. Some woodlots have survey plans of the boundary lines. These plans can accurately show where the boundary lines are located and the amount of acreage that is contained within the boundaries. Another resource to assist you is the Land Information Centers. You can obtain a photocopy of a property map which will have the property lines identified. You will need to provide the center with a property identification number (PID) which you can obtain at your municipal assessment office. The information on this property map may not be as accurate as a current survey plan. The Land Information Center if located at 5151 Terminal Road, P.O. Box 2205 Halifax, NS, B3J 1V7. You may also visit one of the regional offices. Offices are located in New Glasgow, Lawrencetown, Bridgewater, Sydney, and Amherst. The toll-free number for more information is 1-800-798-0706 (Amherst). Color aerial photographs (1:10,000) can be purchased at the Land Information Centers described above. Aerial photographs give you a bird's-eye view of the property. You will be able to see the type of vegetation on the property, and other features such as roads, fields, wetlands, openings, and gravel pits. With the purchase of stereo pairs (photographs on either side of the property interest) you may use a stereoscope to view the woodlot in 3-dimension and therefore be able to see the heights of trees and topography of the land. Topographic maps may be used to give you a sense of the topography in a localized area and are particularly helpful when you are looking for a certain type of terrain. These maps are also available at eh Land Information Centers. GIS Maps have been developed using current provincial forest cover inventory data. The maps contain information such as timber volume, timber height, size of stand, species and other important information for specific stands within a woodlot. The information contained on the maps has been provided by professional photo interpreters using aerial photographs. Some of the sites have been ground checked for accuracy with the photo interpretation work. However, have this information verified as accurate before using the GIS information as a basis for a land purchase. You may obtain GIS maps from the Department of Natural Resources, P.O. Box 68, Truro, NS B2N 5B8 (902-893-5650). You will need permission from the woodlot owner before information will be released to you. Summarizing all the information to produce a clear and concise picture of the resources on the woodlot can be complex. Private companies, located across the province, have foresters and forest technicians on staff who have years of experience dealing with woodlots and their resources. You may consult them to review the information you have collected and to get assistance in obtaining more information if necessary, such as a timer cruise. One service that you may want to obtain from these professionals is to walk the property with you and point out features such as boundary lines, recreational potential and stands of mature timber to name a few. Their experience allows them to navigate quickly through the forest, allowing you to see as much of the property as you wish. There is no substitute for sound professional advice. After researching the property and identifying the resources that are present, the next step is to determine the value of the property. Determining the value of a property can be described as building a tower. You start with a base and continue to add to it as resources are identified and valued. The first platform of the tower is the bare land value which is what the marketplace is willing to pay for woodland that does not have any resources on or under it. Bare land values vary throughout Nova Scotia depending on local market conditions and types of terrain. It's can even fluctuate within an individual woodlot. For example, fertile, well-drained areas generally attract a higher value than barrens or poorly drained soils. To determine the bare land value in the area you are interested in, you could contact a local area forester, forestry technician, or talk to a local land appraiser. A cutover woodlot is usually only worth bare land value unless other resources such as gravel have been identified. Timber value refers to the timber resources on the property. In the past, timber resources generally referred to merchantable timber; however in recent years, timber value has expanded to include pre-merchantable timber. Merchantable timber refers to the fibre that could be harvested and sold at present time, if it has a market. The value is determined by estimating the volume of merchantable timber on the property and multiplying local stumpage rates. Merchantable timber is the sawlogs, pulpwood, chips, firewood, and hardwood logs that can be sold from the property. Mature and young trees both establish woodlot value. Pre-merchantable timber refers to the timber that has no present market but that is expected to become merchantable timber in the future. Values are established based on the estimated number of years from maturity or merchantability; for example, young stands of wood are significantly less valuable than stands that are close to merchantability. If a woodlot contains a lot of timber, have the timber cruised by a professional, since the timber value will represent a large part of the purchase price. Woodlot recreation, as discussed in Module 9, includes a lot of activities. A woodlot that can provide for such activities has more value than one that is not suitable for recreational uses. Woodlot recreation is a personal choice and the value will increase or decrease depending on personal objectives. Unless a woodlot is completely inaccessible, woodlots lend themselves to personal recreational uses and enjoyment. There are many activities that woodlot owners may enjoy on their woodlot, including hiking, snowmobiling, hunting, all terrain vehicle riding, camping, horseback riding, bird watching and cross-country skiing. To have access to these, a potential woodlot purchaser may be willing to pay more for the woodlot. Some woodlots, often due to their location or unique characteristics, have commercial recreation potential. If you are interested in learning more about commercial recreation value, please read The Woodlot Recreation Manual by Glyn Bissex. (See additional readings). Gravel deposits can increase woodlot value. When assessing a woodlot, the value that lies underground is sometimes overlooked. Deposits of gravel, fill and gypsum can be located on woodlots. If a market develops for such deposits, the woodlot's value can increase significantly. Most of the minerals located on your property, such as copper, zinc, or gold are owned by the Province of Nova Scotia. However, before they can be mined, access would have to be granted by the woodlot owner. Granting access can be profitable. Woodlots that are adjacent to roads, lakes or beaches have additional value. The demand for frontage has increased in recent years, and with this increased demand, the value of property with frontage has increased. The demand is high because people want to build homes or cottages along roads or near a beach or lake. These types of woodlots can be very valuable. Granting buried cable right-of-way can provide income. Granting access to your land can generate income. Corporations, pulp and paper companies, sawmills, governments, utilities, pipeline companies, and individuals may want access through your property. It is common practice to compensate the landowner for such access. The right-of-way agreement is usually a legal agreement registered with appropriate authorities. After assessing the woodlot for the above values, a price can be determined. The total price will be bareland value plus the value of other resources. This may not be the price offered for the woodlot, but there will be comfort in knowing the value of the lot. You may want to have an appraiser or a forestry professional to help establish the values of the resources. When investing in a woodlot, make sure that you receive a good and marketable title. Two types of deeds generally used to transfer woodland are the Warranty Deed and the Quick Claim Deed. A Warranty Deed is preferred and in most cases required by most buyers. It is a deed where the seller (grantor), through covenants (promises), guarantees the buyer (grantee) that he owns the total interest in the property and promises to allow the buyer to quietly enjoy the lands. By making these promises, the seller has an obligation to settle any future competing interests for the title. If a competing interest for the title arises and the seller does not settle these interests, the buyer has the right to sue the seller. A Quick Claim Deed is an instrument for the seller (grantor) to transfer all his or her interest in a property to the buyer (granter). Unfortunately, the seller may not own any or only have a partial interest in the property being transferred. This creates a problem for the buyer, as he is not assured that he is purchasing the total outstanding interest in the property. If there was a future dispute over actual ownership of the land, the buyer has to settle these competing interests on his own. He has no other recourse. Whether transferring property by warranty or quick claim deed, you should obtain the services of a lawyer to prepare the deed and search the title for the property. Your lawyer will search the title back for 40 years to make sure that there have been no judgements or lies against the property. Also, he will make sure that there is no gap in the transfer of the title in the past that may present future competing interests for title. After completing the search, the lawyer will present you with a Certificate of Title. In this document, your lawyer states that he has carried out a search and in his opinion, you have a good and marketable title. If the title turns out to be poor, and it can be shown that the lawyer made a mistake, the buyer then has legal recourse and could sue his lawyer. All properties are not located along existing roads or right-of-way. Some are completely surrounded by other woodlots (landlocked). Before obtaining a property, make sure that there is a legal right-of-way. If there is none, you will have to obtain one. If unable to obtain a right-of-way to a property through agreement with adjacent landowners, the Private Ways Act can be used to obtain access. This is a Nova Scotia Provincial Act that allows the landowner to apply to a municipality to gain access to his woodlot through and adjoining property. This is an expensive way to gain access as the right-of-way has to be surveyed and the application process will require time. In New Brunswick, the process would have to be pursued through civil courts and the landowner would have to prove there was no other way to gain access.